By now, it's almost inevitable that you've heard of the street artist named Banksy. Whether just from reading this blog, or your own personal interest in his work, it's impossible to deny the fact that he has been one of the major driving forces behind the acceptance of street art into the world of high culture. After getting a start 20 years ago in Bristol, UK, Banksy has since graced some of the world's leading art galleries and auction houses with his work, all while maintaining a sly sense of notoriety - though whether or not this can be considered more than a marketing ploy at this point is up for debate. One of the most interesting consequences of his style of work, however, is the question of ownership. If a kid with a spray can and a stencil creates a piece of work, typically it's either ignored, or eventually removed by a town council's anti-graffiti group. When the artist behind a stenciled piece is an internationally renowned figure, however, people start to sit up and take notice. But who owns the piece? If Banksy had created his work on canvas he bought, naturally he would be considered the owner by copyright law. But considering that he uses real property that belongs to someone else (and without their consent), does the piece automatically become the property of the owner of the building or structure that acts as canvas? This question was recently highlighted by a Banksy piece that appeared on the wall of a community centre in Bristol, back where the phenom got his start. 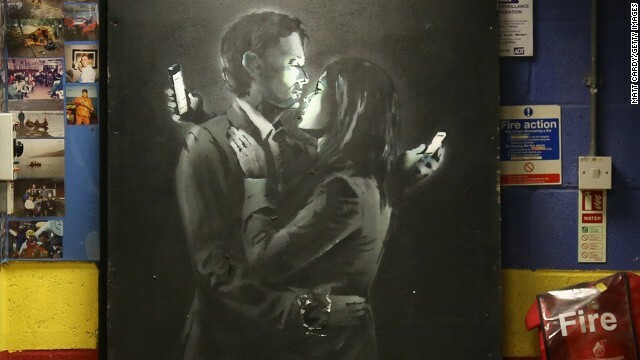 The piece, which was apparently titled 'Mobile Lovers', was initially released in an Instagram photo, which fans finally tracked down to the Broad Plain Boys youth centre using digital sleuthing techniques that included Google Street View. Within a few hours of the piece being properly discovered, however, members of the youth centre had removed it from the wall with a crowbar and set it up inside. While they are allowing anyone free access to view the piece, they are requesting a voluntary donation to help keep the centre up and running. It will be interesting to see what they plan to do with the piece in the long term, as Banksy originals have been fetching large sums of money at auction houses all over the world - although there may be some complex legal implications if they do attempt to auction the piece.